These can be accessed by visiting the hospital’s website. 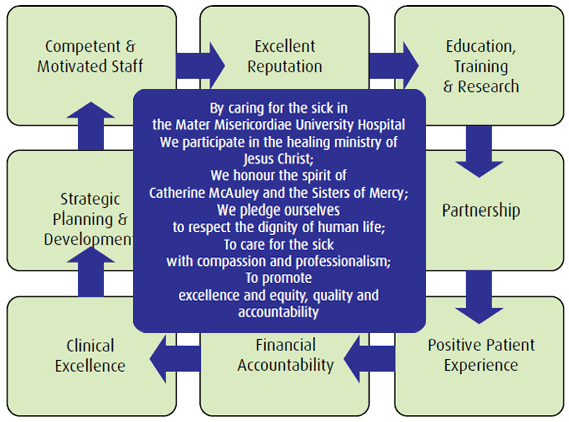 An example of a hospital mission statement can be seen below. The Venerable Catherine McAuley founded the Congregation of the Sisters of Mercy in 1831. The visitation of the sick poor in their homes was one of the characteristic works of the Sisters from the beginning. Catherine McAuley's aspiration to establish a hospital became a reality when the Mater Misericordiae Hospital officially opened on September 24th 1861. Today, the Mater Misericordiae University Hospital continues in its healing ministry to the sick, regardless of class, creed, or nationality. The Hospital's Vision, Mission and Ethos are enshrined in the Hospital's Mission Statement. As you can see from the above, the employers will be looking for a competent, motivated basic grade physiotherapist that excels in clinical excellence, who values their own education, training and research and who thrives to provide a positive patient experience. Knowing this prior to our interview allows us to be confident that if you instil the above into your interview you will be sure to make a meaningful impression. Furthermore, it is important to familiarise yourself with the specialities of the physiotherapy department you are preparing an interview for. For example, in the Mater’s musculo-skeletal service they provide hydrotherapy classes, weekly lower limb rehabilitation classes for patients following leg injuries, “Back in Action” weekly exercise classes for patients with chronic low back pain, week-long intensive exercise and education classes for patients with Ankylosing Spondylitis, in-patient orthopaedic services are delivered over six days. Knowing all this you can refer back to placements and let them know why you are suitable for the job for instance if you partook in hydrotherapy classes, lower limb rehab classes or back-care classes. This can also be applied to the cardiorespiratory department. The Mater has an emergency department, critical care units (ICU) and an out-patient pulmonary rehabilitation service which involves supervised exercise sessions and education regarding the self-management of respiratory conditions. If you have attained experience in working on ICU or in pulmonary rehab on previous placements you can draw upon your experiences to better equip yourself for your interview. In relation to the hospitals rehabilitation service knowing the types of conditions seen in the hospital will also better equip you for your interview. For example, the Mater is an acute hospital treating patients with stroke, movement disorders, amputation, head injuries. Having experiences treating any kinds of these conditions can be a great chance to talk about previous placements and what you learnt etc. Electrotherapy, ultrasound, interferential or Laser. Tailoring home exercise programs to the patient so that they can keep working on their recovery between your sessions in your own time. These may include stretches, strengthening and core stability, and are especially important in minimising the risk of re-injury. Discussing any important lifestyle factors such as desk postures and exercise activities that may need to be adjusted to help you recover. The use heat or ice to help speed up your recovery. When preparing for an interview in a private practice it is important to show that you have experience or at least an interest in one or more of the areas that the private practice offers. Any courses such as pilates, dry-needling, sports taping or strength and conditioning may stand to you when applying for a position at a private practice Furthermore, other things to note are, is the private practice affiliated with any local teams, the exact location of the private practice, access to parking and how to get there. Lastly, give yourself plenty of time!